Okay, this is the last quadcopter-to-“Star Wars Universe”-thing we (or at least I) will post*, I promise. BUT SERIOUSLY, LOOK AT THIS THING. It is perfection. About 30 seconds into the video, I actually stood up and whooped. We’ve seen the Millenium Falcon quadcopter. We’ve seen a TIE Interceptor quadcopter. But a Speeder Bike? WITH a Scout trooper on top? This… this is perfect. It brings one of the best scenes from Return Of The Jedi to life in an straight up magical way. 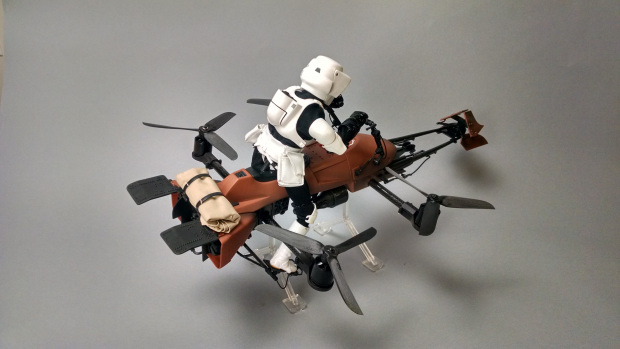 By gutting a 1999 Hasbro POTF Speederbike and strapping its bits to a low-flying quadcopter, Adam Woodworth has made a toy that would have made 12 year old Greg throw every penny of his allowance at the screen. Hahah, who am I kidding; Now-28 year old Greg would throw all his money at this, too. You can read about Adam’s full build process, including figuring out how to get that relatively-heavy frame up in the air, right over here. If only there was a camera in the helmet for first-person tree-dodging footage.. OH WAIT, THERE IS. Dear Disney: make this. Seriously.